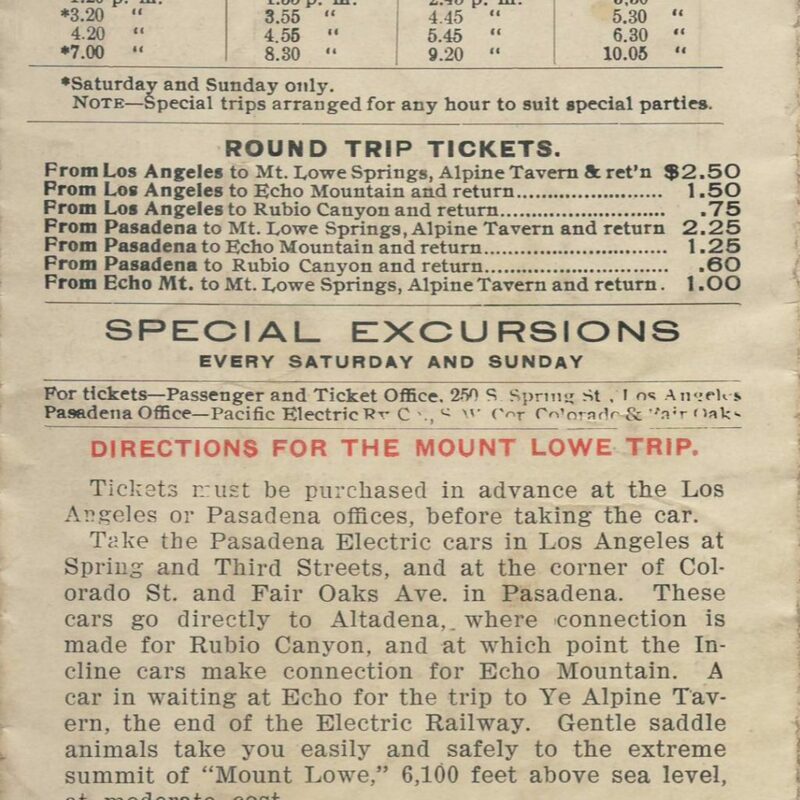 The Pacific Electric Railway, after making the purchase of the Mount Lowe line, wasted no time in incorporating it into special advertising and timetables. This timetable dates from September 1902 and depicts the triangular PE – Mount Lowe logo, with the vista points Valley, Sea Shore and Mount Lowe named within the logo. Whereas Lowe called his railway, “Earth’s Grandest Mountain Ride” the PE continued in the same way by calling it, “Grandest Scenic Trip on Earth.” Six double sided panels share the scenic points and cities, including East Los Angeles, Highland Park, Garvanza, South Pasadena, Pasadena and Altadena and “Up and into the Beautiful Sierra Madre Mountains.” Offices for ticket information were at 250 S. Spring Street (Stimson block) in Los Angeles and the Pacific Electric Railway Pasadena Office on the SW corner of Colorado and Fair Oaks. Round trip from LA to Alpine Tavern and back was $2.50; trains ran from as early as 8:00 am until 10:00 pm. 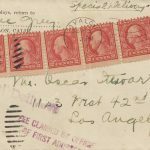 Also mentioned is the newly constructed “Casino” which was not a gambling establishment, but a dance hall (50′ by 100′) which was also equipped with a bowling alley and fine croquet grounds. 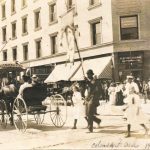 Interesting..was the hotel still standing in 1902? Would the Casino be in that building off to the right? What’s the known history of it?